After a weekend enjoying the progress I’ve made with Tally, I’m finally ready to tell her story – of the challenging year we’ve had, and the price we’ve paid for my very costly mistake. seven she knew only basic leading and would stand for a hoof trim, and that was it. When I renewed my drive to do something with the horses (beyond just paying their bills) I set about the task of teaching her how to learn. She had all the qualities of the worst broodmares – adapting to new demands (no matter how simple) and learning new things were not on her agenda. But I persisted, and with time, we slowly made progress. I had not been riding much at the time I started this process, so I made the decision to find someone to start her under saddle. I have only sent two other horses out for starting – one with an excellent result, and one was a disaster we never fully fixed. I was determined to find just the right person – and I thought I had. But, by the time the date was approaching to take Tally over, I began to reconsider. I knew that I was running a risk in sending her away, and she was coming along so well that I began to feel I would be able to manage, given enough time. However, I had committed, and I had enough lingering doubt that I ignored my gut feeling – a decision that Tally and I would end up paying a high price for. 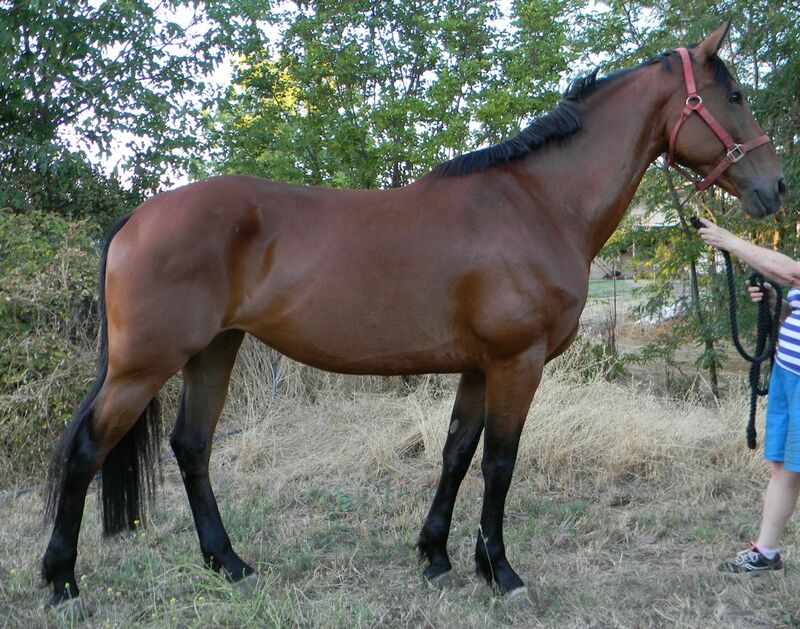 the point of leaning at nearly 45 degrees to the ground – a somewhat painful position for a nearly 17 hand horse on fine legs. She was allowed to swing around at the tie rail while being groomed, fly sprayed and tacked up. Although the trainer had a laissez faire attitude about this, it did not help teach the mare to be calm. Tally was kept in a paddock where her neighbors could reach her from both sides, so she never had quiet moments without interference. 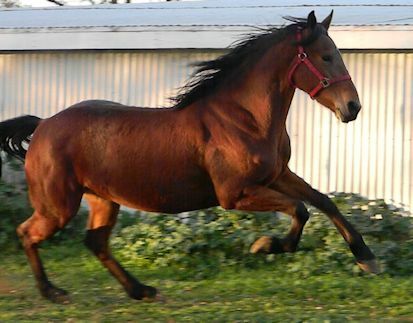 A few weeks after arrival, Tally was injured in an incident in a trailer. The way it was originally related to me, it sounded rather minor, and she was given several days of rest. It turned out to be much more serious, but I would not find out how serious until much damage was done. 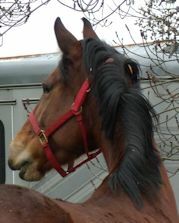 Following the trailer incident, her previously compliant yielding to the bridle became a growing resistance. In answer to this, the trainer employed a running martingale for leverage. By the time that I was finally confident that my growing concerns were not just over-protectiveness, we no longer recognized the doe eyed, lovely mare we’d sent there. On her last day there, I climbed on for the first time. I was struck by the lack of response to the reins – they might as well have been tied to the arena railing. I was also puzzled by the complete lack of movement under my seat, at walk or trot. I had heard that Friesians don’t have a lot of natural back swing, but this seemed somehow freakishly immobile. Even with all of that, I was still worried that I was over reacting. I would soon find out just how much my concerns were well founded. and sounds, she was now hyper vigilant. There was no arguing that she was fit, but her once strong topline was now inverted. This transformation had taken just three months. It happened that soon after we brought Tally home, my vet was scheduled to come over for dental workups. She took a look at Tally’s injury and declared it still very soft and painful. It turned out to be a fractured splint, right where the suspensory ligament crosses it – a standard 90 day healing. She also had significant back pain on the left side. It was unclear whether this was a result of postures used to protect the injured left hind, or was itself a direct result of the trailer incident – but it was clearly the reason why she had suddenly refused to flex to the right. It was also contributing to a now somewhat aggressive attitude during grooming. over time, and overcoming it has tested all of my skills as a trainer. In my next post I will outline the list of behavioral issues that resulted from my most costly mistake, and the strategies I’ve employed to regain her trust and redevelop a sound working relationship. 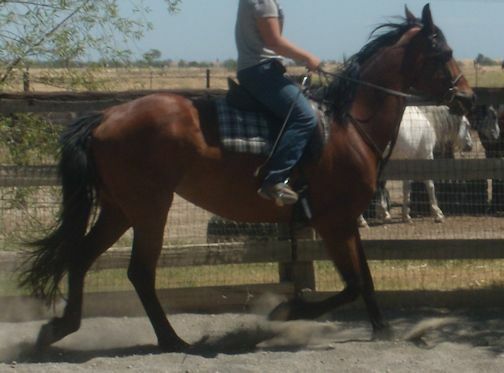 This entry was posted in My Journey and tagged Horse training, Tally, trust. Bookmark the permalink. 2 Responses to A most costly mistake!